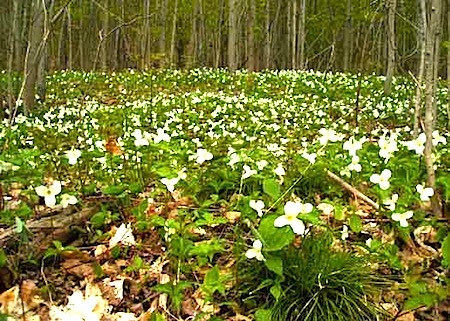 BENZONIA, MI — Just as the first flying flakes of snow in October signal the onset of winter here in my hometown, the emergence of the snow white petals of the forest-dwelling trillium are a strong forecast of summer’s welcome warmth. No more so than this year. It’s been an unusually cold and wet spring. The ice didn’t come off Crystal Lake until well into April this year. On April 19 and 20 it snowed for two days. Water levels in Betsie Bay and on Lake Michigan are up this year, higher than they’ve been in awhile. That’s a good thing. But the chill and moisture are worrisome, and for good reason. It brought back memories of 2004, when the summer was so cold I biked just three times wearing only a short-sleeve shirt. The rest of the time we were in layers. Ask anyone who lives here and they’ll tell you cold summers are meteorological cheat. We live through the long winters knowing that they will end in the promise of a warming spring and a hot summer. Cold summers mean something much different. They ensure we’ll be cold for 20 months in a row, just as we were when the cold started in October 2003 and didn’t end until May 2005. This month, fortunately, it looks as though we’re not going in that direction. Our first bike rides of the season this week occurred in sunny, dry, warm weather. For those of us who’ve found a way to live, even thrive, in this place so far from the mainstream, weather is a big deal. Our lives are bound up in the seasons in a way that is much different than most people we know outside of this part of northern Michigan. That’s part of the challenge and a great deal of the magic of why we are here. Previous PostPrevious Gas Hits $5 A Gallon in Washington, D.C.